Living in the Puget Sound on an island makes it hard to connect with the rest of the state. Especially in the 2012 election year, it was clear that East and West of the Cascades see life in fundamentally different ways. I set off with my 4x5 camera to explore this "Eastern" environment, camping in mid-winter 2013 in my pickup truck. All images in this gallery are from TriX film, developed in HC110 "B." The Palouse area in Washington and the area South of Baker City in Oregon were my destinations based on many trips through each. The Oregon photos concentrate on post-agricultural remnants 10 miles South of Baker City ("Pleasant Valley" exit on I-82) and a post-industrial cement factory at Lime (30 miles further down the Interstate). "Pleasant Valley," seen after snowfall, might suggest that 100 years ago folks had a different perspective there during the time that my own grandparents were living more comfortably as city dwellers, business and professional people. 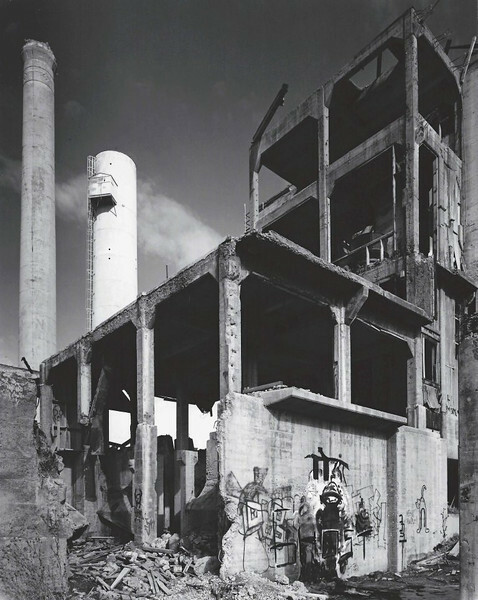 "Lime" as an abandoned and partially dismantled cement factory is a jolting warning of how transient even the largest industrial efforts might be. Despite this, Lime was enlivened by the creativity of spray-paint artists who left their work behind for wandering visitors to discover. This sense of creativity for no commercial gain is definitely a bright spot in the terrain. On the Washington side I worked back and forth through the Palouse, finding bridges, barns and of course, the spectacular Palouse Falls. My route follows SR26, 260 and 261 until you come out at the Southeast on SR 12 heading towards Clarkston. If you go this way, eat at MJ's in Connell or Huwe's in Starbuck. Donna's in Pomerell has closed, unfortunately. Time your trip, if you can, to stay over night at Palouse Falls State Park on 261 or at Chief Timothy Park on SR12, which is close to Clarkston. At the end of this section I have added 4 prints from return trips in April 2017 and February 2019. The first time I camped at Lewis and Clark Trail State Park near Dayton. It's more comfortable and a great breakfast is available at Carolyn's Café in Dayton. Spring runoff was at peak flow. For the next two I tried for a little snow and got a full blizzard. Expecting cold weather I did those in medium format.